Yoga, Guided Meditation and Gong, All Super-Charged by Raw Cacao! Do you feel the change of Seasons? Would you like to tune into this feeling on a deeper level and connect it to your yoga practice? If so then join us for our Spring Cacao Ceremony, led by experienced Cacao Guides and Sound Healers, Guru Ben and Red Clare, this session will bring together sacred sounds, kundalini yoga, guided meditations and raw chocolate to create a healing ceremonial space where you can safely let go and set intentions for the new season. Spring is the season of rebirth, the lengthening days and warming temperatures awaken us from our Winter slumber and this 4 hour session will give us the time to do that and connect to our bodies changing rhythms and energise our mindset for the months ahead. This will be a transformational session that will leave you feeling amazing, especially as Cacao is a natural high which releases bliss chemical in the brain, plus it will give you an insight into you intention for the new season! So if you would like to tune into spring, bliss out on cacao and have great afternoon in a communal space, then come join us! Guru Ben and Clare are experienced Cacao Guides and combine sacred sounds, kundalini yoga, guided meditations and raw chocolate to create a healing ceremonial space where you can safely let go and set intentions for the new season. Your practice will be deepened by working with raw cacao, a plant medicine from South America which has been used for change and transformation since ancient times. A verified super food it contains high levels of magnesium and the ‘bliss chemical’ anandamide which produces a naturally elevated feeling and will enable us to go deeper into ourselves whilst being more open in our practice and creating a sense of connection and transformation that will long continue after the ceremony itself. So if you would like to honour the Autumn Winter Transition in a beautiful ceremonial space then please book on today! The space will be held by Guru Ben and Clare. 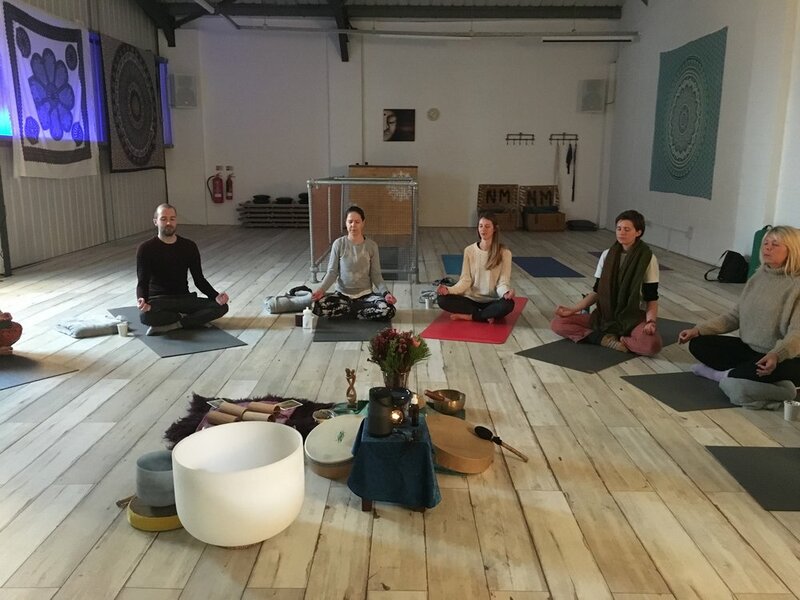 Guru Ben is an established and creative yoga teacher, fusing Hatha and Kundalini Yoga styles with Zen Meditation, whilst also being an accomplished sound healer who holds regular gong baths across Essex. Clare is a respected pregnancy yoga teacher, who is passionate about empowering women through her classes, she delivers fantastic guided meditations that take her students to new realms within themselves.